The ‘snap’ happens in that instance when you take your first bite. The crisp white chocolate cracks apart and the cookie inside literally ‘snaps’ in half. Next comes the silence as you’re tip-toeing away, trying to hide these cookies from your family and keep them all for yourself. And of course, a private mom-only stash of these babies is the only wise way to handle the stresses of this holiday season. Nom nom! Ok, I ate my stash, now onto the business of making these rad cookies. 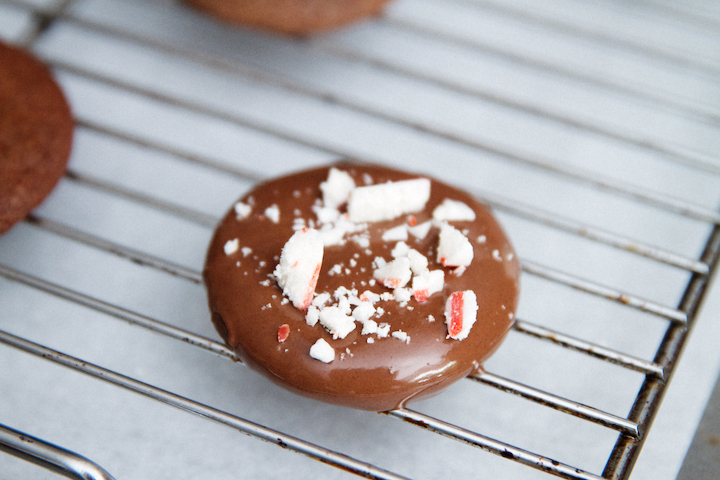 I love alternating white and dark for these chocolate peppermint cookies. You can use any peppermint stick or candy that strikes your fancy. These were the ones I had on hand! The dough itself is straight forward, nothing fancy. Just put it together and keep it in the refrigerator. It is a bit sticky, so I suggest rolling the dough in plastic wrap to save yourself some trouble. 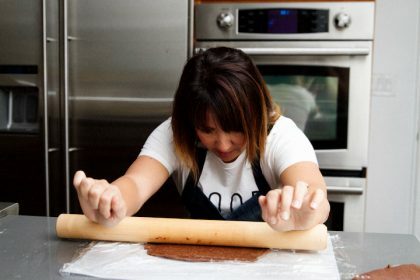 I usually dust with flour, get the roll going, then stick it between two pieces of plastic wrap. Then I pop it in the freezer for five minutes to harden slightly before I cut these cute little circles. 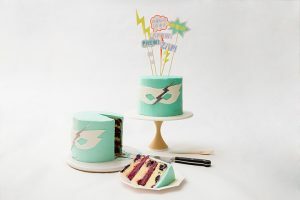 I used both 1.5″ and 2″ cutters. I always love to offer a variety. If you don’t have those sizes, look around in your stash of goodies, usually something round and sharp enough will turn up. Then after I cut the cookies, I pop them in the freezer once again for five minutes and then bake. You can omit this last step, it just helps with keeping the cookie tight and not over-expanding while baking. Be sure to buy high-quality peppermint extract. I used Nielsen Massey peppermint flavor. Also, be conservative when you use it in the dough and the sauce. I am guilty of being a little heavy-handed, as I often think this will increase the wow factor, however in this case, my kids said it tasted like a giant mint leaf. Eeeek, not the desired effect that I’d planned. 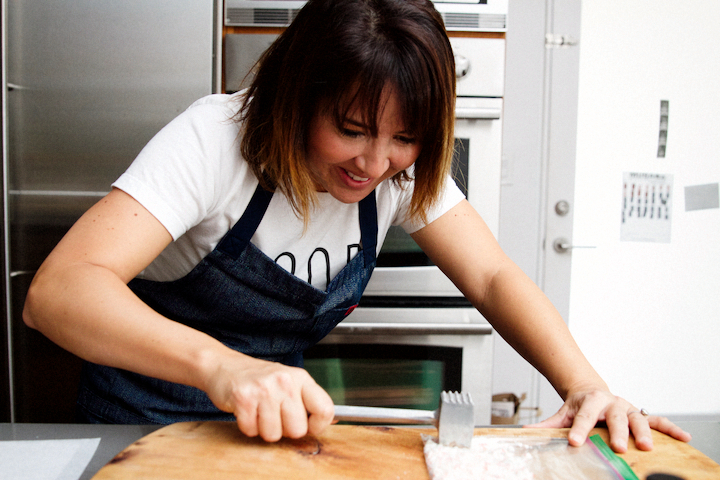 So, just don’t go crazy with the peppermint, ok? Next comes the most satisfying part of making this recipe. Hammering! 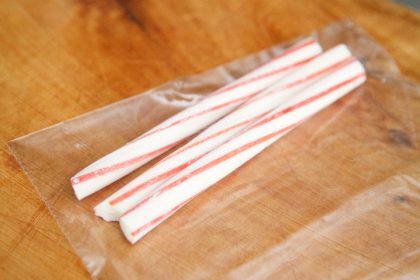 Yes, grab those peppermint canes and throw them in a ziploc. Whenever that stressful moment of the week hits you, start hammering away. I tell you, I feel slightly guilty with how cathartic this experience can be. Don’t worry, I don’t do this often! But if you want to, why not? 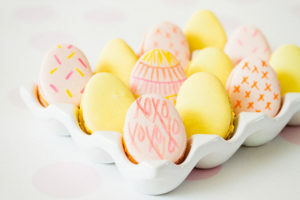 Once you have all of your chocolate melted (Wilton or Chocoley are my favorites), your candy crushed, and your cookies baked, you can dip and dot with candy decoration! I dip it, shake it out a bit against the side of the glass, and then top it with candy. 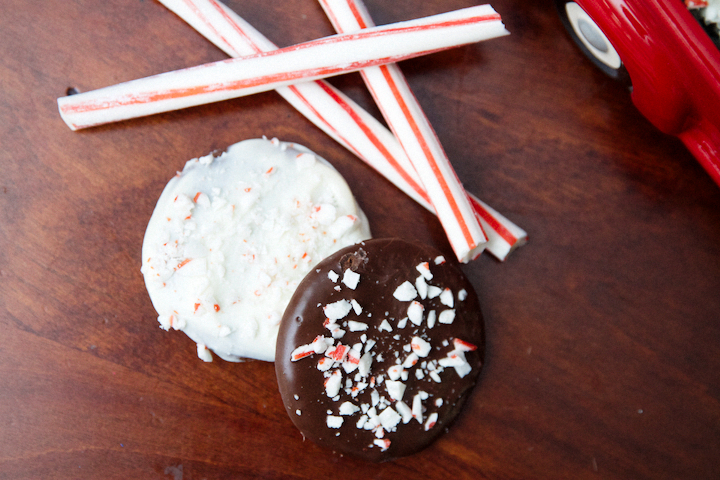 It’s so satisfying when the peppermint crush covers the cookie! YUM. Prepare yourself because this one can be quite messy. Don’t worry if the coverage on the cookie from the dipping is not perfect (I know, I know, but really, it’s ok!). The candy will cover any imperfections and you won’t be able to tell at all! So, where are you going to hide your stash? I actually like to put my stash back in the freezer. No one’s looking in there plus the little ones are still too short to see up that high. 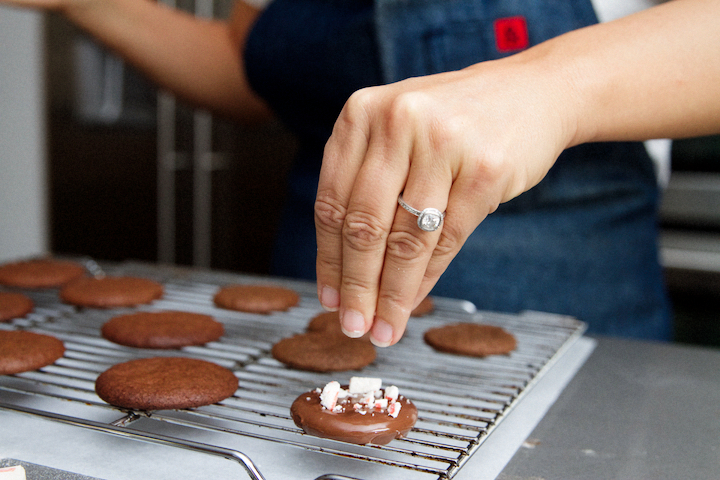 And it really is kind of a baker’s secret to enhance that snap in the cookie by keeping it cold and frozen! You might find a better place, and if you do…let me know, ok? Lastly, we all have kids trucks, cars, or some type of contraption that carried mud or sand at one point in its lifespan. 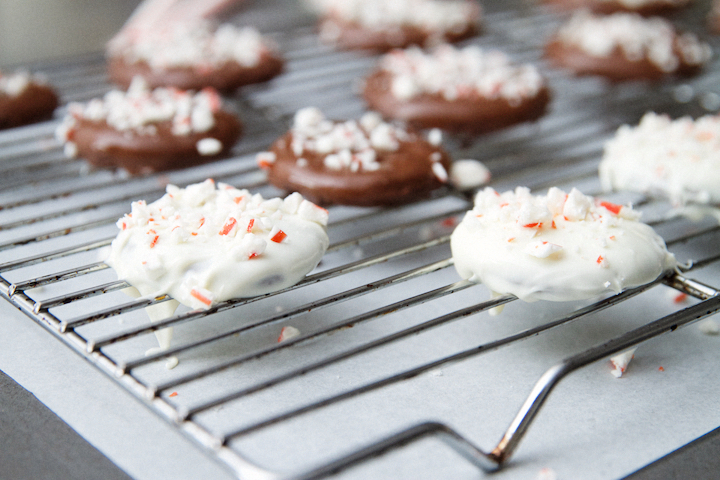 Clean it out, put some winter greens in there, and load in some of these fun, chocolate peppermint cookies for the kids. They will love the idea of participating in either making the cookie or rolling the toy right out onto the Christmas party table. I used one I bought at Roger’s Garden in Orange County. Cheers moms! 1Preheat the oven to 325 degrees. 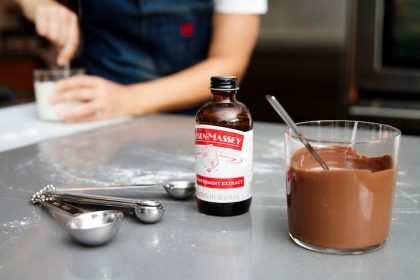 In a small bowl, whisk together the flour, cocoa powder, baking soda, baking powder, and salt. 2Mixer: With the paddle attachment, beat the butter and sugar medium-high speed for 1 minute. Reduce the speed to medium-low and add the egg and egg yolk. Mix well. Beat in the peppermint extract. 3Slowly add the flour mixture, and beat until just incorporated. 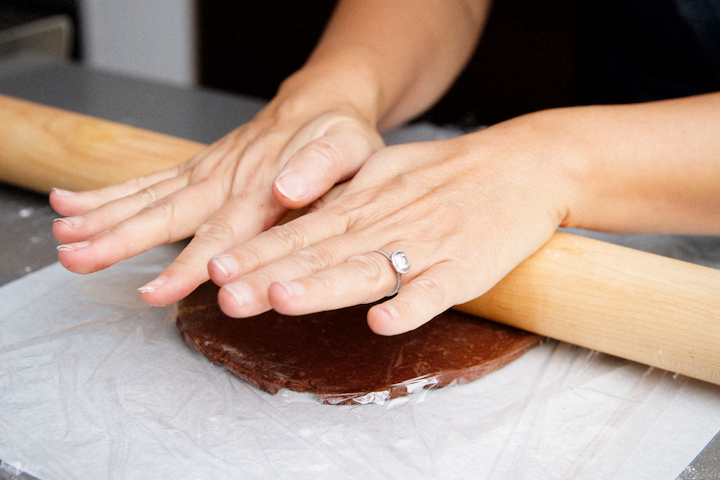 Shape the dough into 2 disks, wrap each in plastic, and refrigerate until firm, at least 1 hour (or up to 2 days). 4Roll out 1 disk of dough on a lightly floured surface to 1/8-inch thickness, more or less. 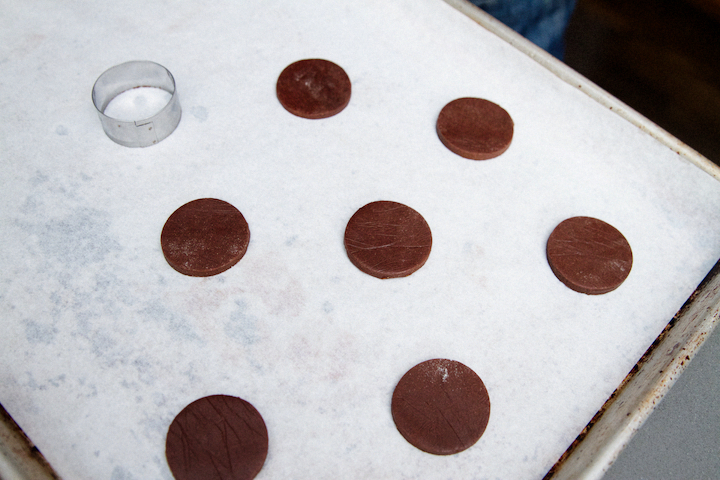 Using a 2-inch round cutter, cut out circles and place 1-inch apart on parchment-lined baking sheets. 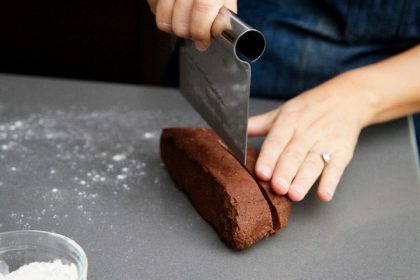 Roll and cut the scraps once or twice (the cookies will be a bit more dry with each re-rolling). Freeze the tray of cookies until firm, about 15 minutes. Repeat with the remaining disk of dough and freeze also. 5Bake the frozen cookie rounds until they are dry to the touch, about 12-14 minutes. It's really important to bake them all the way through so they are crisp and not soft. 6Transfer the baked cookies to a wire rack to cool completely. The undipped cookies will keep well covered, for up to 3 days. 7Melt the chocolate in a heat-proof bowl in the microwave or in a double boiler on the stove. (I like to melt it in the microwave at 1-minute intervals at 50% power, stirring in between.) 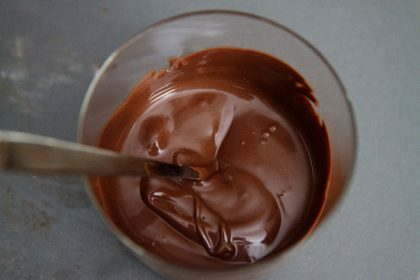 Melt the white and dark chocolate separately, if using both. 8Dunk the cooled cookies into the melted chocolate, one at a time. 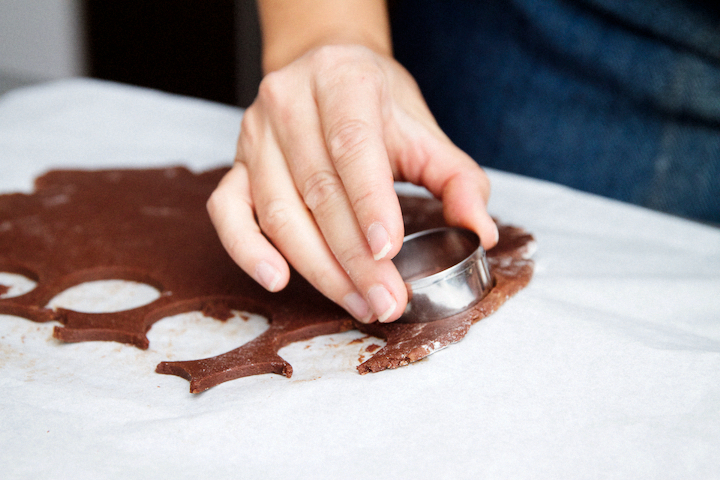 Using a fork, press lightly on the cookie until completely submerged in the chocolate. Pick up the cookie with the fork, let the excess chocolate drip off, and gently scrape the bottom of the cookie against edge of bowl. 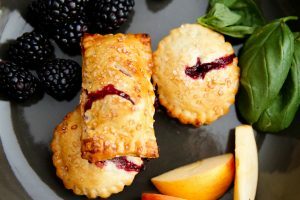 Using the flat edge of a knife or another fork, gently push the cookies onto parchment or wax paper. 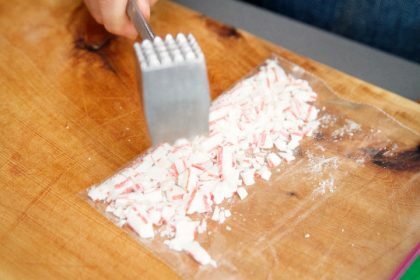 Sprinkle with crushed candy if using. Let the cookies sit until the chocolate has hardened, an hour or so (you can refrigerate to speed up this process). 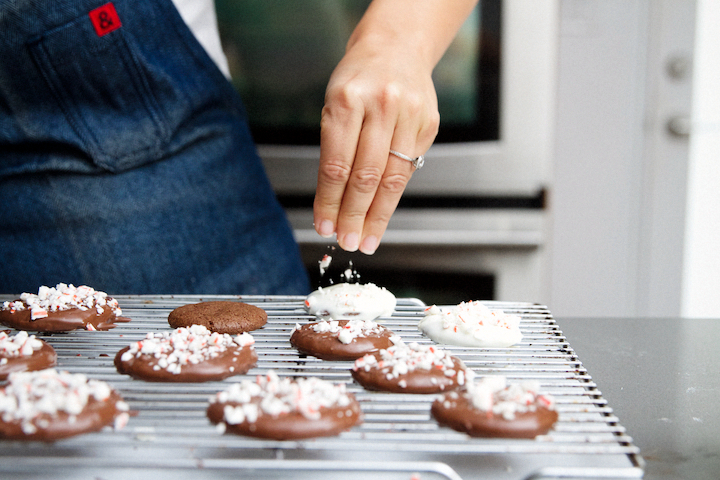 9The dipped cookies will keep covered in the refrigerator for up to a week or in the freezer for up to a month. Can’t wait to try these! Two of my favorite ingredients: chocolate and mint! Yay! 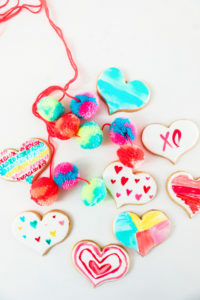 I’ll be making these cookies thus holiday season for sure! 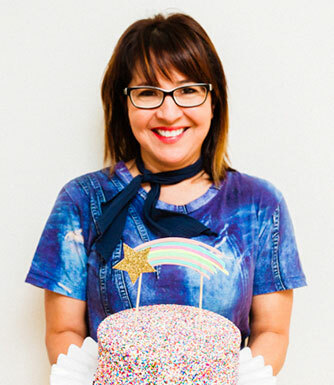 Thanks for sharing this recipe … @thesweetnerd ! Done! 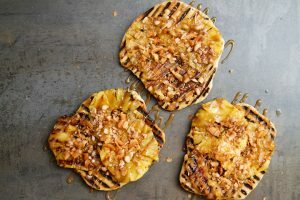 Thank you @thesweetnerd for sharing this yummy recipe. It was easy (which I love) to follow your step by step, explicit, directions. Can’t wait to share them at the Women’s Cookie Swap tonight at church. I’m sure they will win the Grand Prize! Thanks Rose. So glad you tried it! Love hearing it was easy to follow. ENJOY! 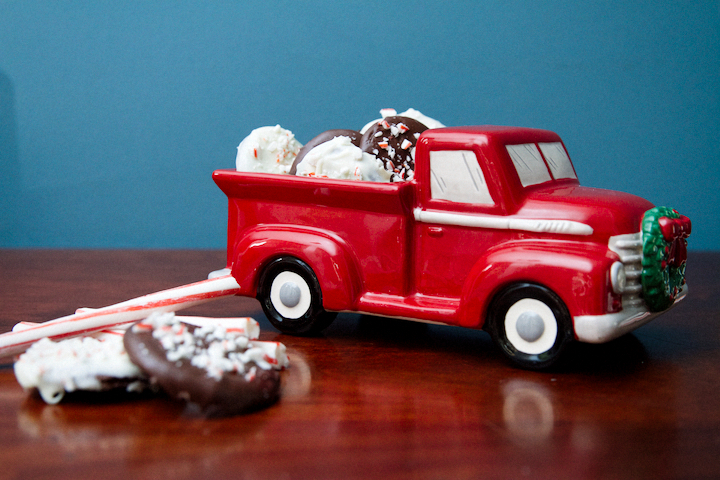 I can think of no better way to get rid of my holiday stress than hammering some candy canes. And no better holiday treat than these cookies. My boys are obsessed with chic/peppermint so these definitely wouldn’t last long in our house. So good! I tell ya, it is cathartic in the sweetest way. Right? Hammer away Cathy. My sister took this to a cookie exchange and all the gals loved them. Hope you do too! 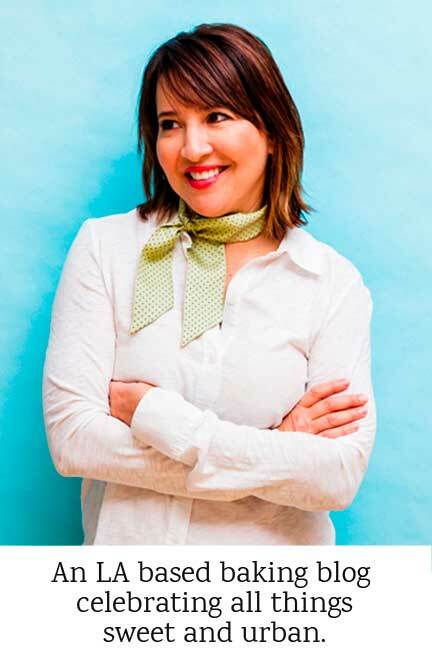 Rose – I’m so impressed you made them already! I’ve put them on my to-bake-with-the-kids-when-they’re-off-school-and-I-don’t-know-what-to-do-with-them list. 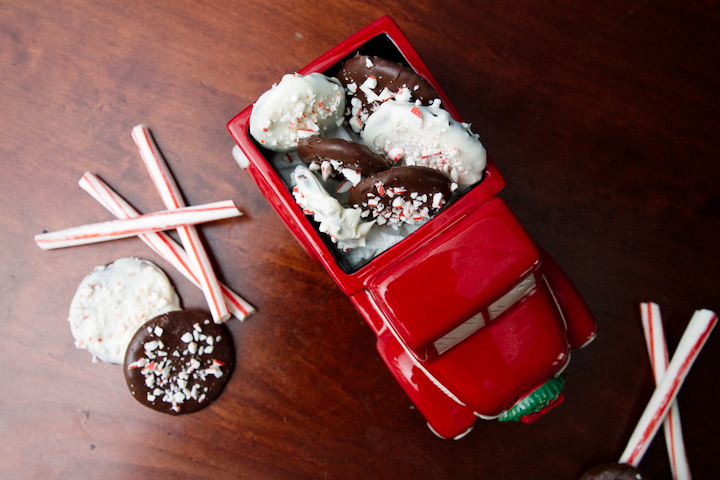 Chocolate and mint might be my FAVORITE holiday combination. Thanks, Cindy. Yeah! Thanks guys and Happy Holidays.